OpenQuest , duh still winning! Ok I’d be the first to admit there’s been a slight slow down on OpenQuest as I focus on getting Crypts & Things done. Not only that but two scheduled supplements have slipped quietly away from OpenQuest. Here be Dragons has gone to a different publisher, and bigger and better things (which is all I’m going to say on the subject for now) and of course now Empires Rising is a HeroQuest supplement (short story it makes more sense that way). So there’s a slight gap in the release scedule since Life and Death was released back in November of last year (oh you’ve not got L&D? Don’t take my word for it but its jolly good ). Soo what I’m I going to do about that. OpenQuest Companion – new optional rules (eg. mass combat, social combat, random character gen), new monsters, new spells and GM’s advice on how to use OpenQuest for anytype of fantasy campaign. This is a book of rulesy stuff. eta end of this year. 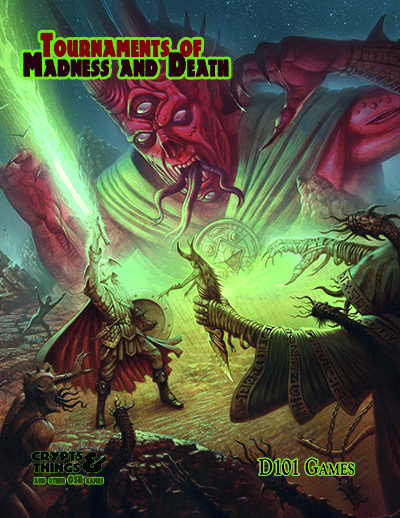 OpenQuest Adventures – every month or so a 10-30 page adventure in pdf format. When we have enough of these out I’ll collect them and do a printed collection. “The Road to Hell” a very dangerous trip to a minor hell for the unsuspecting characters is the first release. A tough adventure that requires intelligence on the player’s part to survive. Next up is either Tomb of the Evil Emperor by me (another epic) or Hidden Gods by John Ossoway. The Chronicles of Erun – I’ll announce this one properly later, but this is going to be my standalone OQ powered game. Its going to have allot of the ideas I wittered on about for OQ2 in it, like social conflict and a single magic system. At its core it will be OQ, but there will be enough tweaks and new rules to make it worth looking into if yo like that sort of thing. If you like detailed settings/characters CoE will be right up your street. eta next year. Until the Crypts and Things playtest ends that is. Already got some really good feedback about the game from a couple of the playtesters and once the playtest is over I’ll collate the ideas into a single doc, mull it over and tweak and amend where necessary. Overall C&T held water quite well, just a couple of areas where some clarity is needed in the text and a few spells (Sleep, Charm and Magic Missile I’m looking at you) which need tweaking. Then its a weekend of polishing and care for C&T, then onwards for Sept/Oct release. Quite keen to get this one out the door and curious to see what people make of the final product. But onto Loz’s announcement, follow the link to the Design Mechanism’s website for the RQ Q&A which gives more details. Its with great pleasure and excitement that I’m able to announce that The Design Mechanism, the new company formed by myself and Pete Nash, has successfully reached an agreement with Issaries Inc to become the new licensee for RuneQuest. The full Press Release can be found on the RuneQuest page at www.thedesignmechanism.com along with a detailed Q&A sheet for those who want to know more about what we have in store for RQ. Clearly its early days for both Design Mechanism and RuneQuest’s 6th edition but we have exciting plans for the game building on the work Pete and I have already done with Mongoose’s RuneQuest II and we look forward to sharing them with the roleplaying community as we develop the new rules. As much as Crypts & Things rooted in the dark D&D gaming of my 80s teenage years, it is inevitable that some of the music I was into at the time spills like warm blood into the work….